Honoring the undivided two natures of Christ. Were commonly beheaded and have the common grace of the Master. Struck by the sword in the stomach. When the sword was stretched near to their necks. Passing from life on a pleasant path. To the Three Hundred and Seventy Seven. Joined together by seven times eleven. All of the above Saints, being from different provinces and places, settled in Adrianople. Then the thankless and forgetful Bulgarians came to battle against the Romans. Having taken the Christians of Thrace and Macedonia captive, they also sought to attack the Queen of cities Constantinople. Therefore they arrived at Adrianople, and waiting for three days they seized it. When these things happened, Leo the Armenian the iconoclast was emperor, and Krum was leader of the Bulgarian nation, in the year 815. 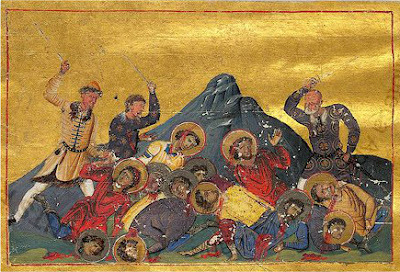 When Krum entered Adrianople and took possession of it,* he expelled from there 40,000 Christians, together with the most-holy Bishop of Adrianople, who they threw onto the ground, and trampled on his throat. When Krum died, his successor in authority over the Bulgarians was Dukum. And Dukum having died, the ruler of the Bulgarians was Ditzevg,** who was a man both terrible and inhuman, who cut in half the Bishop of Adrianople, whose name was Manuel, and after cutting off his arms at the shoulders, he had him cast to the wild beasts to be devoured. Due to his ferocity, he was struck by the hand of God with the inability to see and blindness, and he was killed by his own people. * Krum entered Adrianople in 813. ** The reigns of Dukum and Ditzevg were so short, that aside from the Synaxarion of Constantinople they are unknown to historians. *** Either Joseph of Thessaloniki or Joseph the Hymnographer composed a Canon in their honor, where about 25 other martyrs are named. 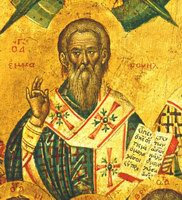 It should be noted also that Theodore the Studite composed a short sermon based on eye-witness accounts concerning fourteen martyrs put to death for refusing to eat meat, likely to have been prisoners-of-war released by the Bulgars after the peace treaty of 816. It could be that it was based on their testimony, now lost, that the above account was written, which together with the Menologion of Basil II is the only text that describes this persecution.